This exhibition inaugurating the new cultural centre Accabi-Hospitalburresi in Poggibonsi between Siena and Florence brings together over sixty works by Silvano Bozzolini (1911-1998) from, public and private collections across Europe. 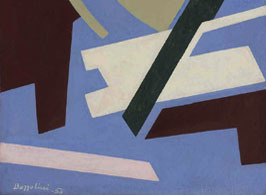 Bozzolini was a prominent exponent of European post-war abstraction and co-founder of the avant-garde group “Espace” that championed geometric abstraction during the 1950’s. Born in Fiesole he studied at the academy of art in Florence during the 1930’s before setting up a group called “Arte d’Oggi”, as well as launching an art journal “Posiziono”, and an artist run gallery “La Porta”. In 1947 he went to Paris to attend the École des Beaux Arts. He supported himself initially by hand-printing fabrics and his sensitivity to the printed aesthetic would reappear in his later work. He first began to explore abstraction in 1947 and, with the likes of Sonia Delaunay, embarked on a classical, constructivist approach characterised by a simple, clean palette and an emphasis on line. While discussing his work Bozzolini said “La musculature de l’oeuvre est à la fois physique et spirituelle”, (the strength of the artwork is simultaneously physical and spiritual). In 1952 he co-founded the avant-garde Groupe Espace, which published the journal “Art d’Aujourd’hui”, an influential voice of geometric abstraction and neo-plasticism. He was close friends with the Florentines Suzy and Alberto Magnelli. He never forgot his Tuscan heritage of the great works of Giotto, Masaccio, Uccello and Piero della Francesca, which were the subjects of his early study in Florence, and he retained in his painting a similar concern with clarity and spatial perception, which brought him international acclaim. Bozzolini held his first solo exhibition in 1949 at Galeria Strozzina in Florence, and then at Galeria Salto in Milan, 1950. His first solo exhibition in Paris took place at the Galerie La Hune in 1951. Numerous further solo shows ensued. The artist is now represented in many major museums. The exhibition, curated by Luca Beatrice and Buscaroli Bozzolini, is promoted by the Municipality and Elsa Foundation , with the collaboration and contribution of Paint Cultural Projects, as part of the cultural initiatives of Siena - European Capital of Culture 2019 candidate city. The catalog "Silvano Bozzolini" by Beatrice and Laura Donati Buscaroli is published by Carlo Cambi Publishers.